Having hired an offshore company to create a series of interlinking websites and social media accounts to help drive online traffic, there was a need to audit the content they had been creating and uncover the cause of their ongoing lag in SEO and overall online reputation results. As happens too often, much of what the offshore company was doing was low-quality article spinning and content for the sake of content – sometimes even the exact same content. The company had stopped bothering to even create lousy unique content. Many website pages were simple cut and pastes. Over and over again. We’d find the same page appearing 2 or even 3 times across the different websites the offshore company had built. In this case, it soon started to appear that the company hired to protect their reputation was who they needed protecting from. With a solid new WordPress website already built, the focus was on optimizing existing content and putting optimization into place for news, blogging, and press releases going forward. Starting with meta tags, there were quality issues surrounding automated content for this particular San Francisco law firm’s website due to the use of the automated content generated by the All-in-One SEO plugin, as was uncovered during the initial audit. 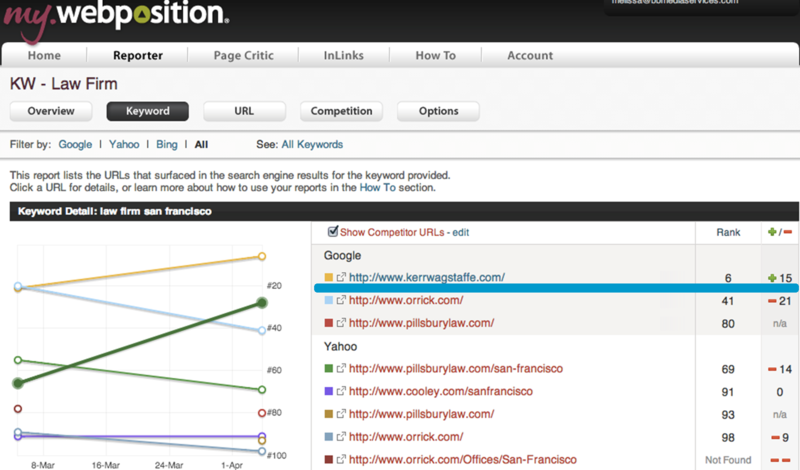 Took ownership of company listings to improve Local SEO, Google Places, etc. 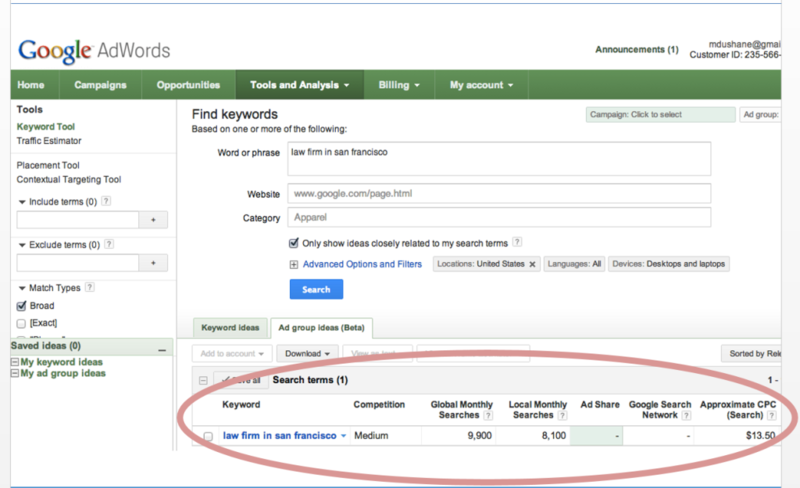 After researching keywords based on search volume and competition, a page-by-page process was put in place to target prime keywords and make content changes on an ongoing basis to the website content, news & announcements, video content, press releases, and external blog content. Internally, there were some issues with using the WordPress website correctly, which resulted in duplicate content being accidentally generated. All additional versions were deleted. Although the firm had a PR company writing many of the actual releases, the content needed to be rewritten for the corporate blog. By writing fresh blog posts, no duplicate content penalty was triggered and the content was targeted to the audience of clients and potential new clients reading about the firm. Key content was extended out to the firm’s external blog, which specialized in victim’s hazing rights. 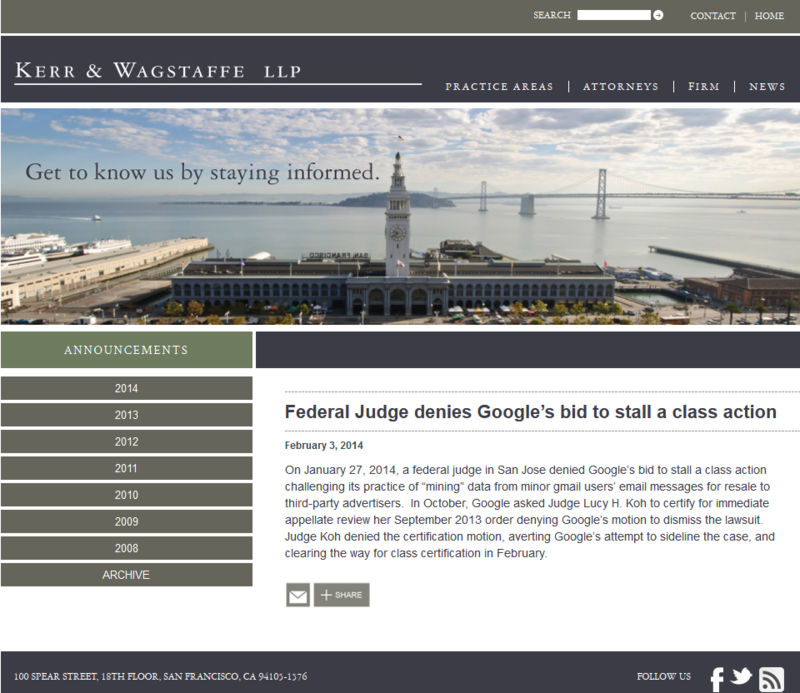 With the offshore SEO company’s emphasis on churning out large quantities of content for the law firm, there was nothing resembling the quality control one of the Bay Area’s top law firms demanded for their main website, their “real content.” All current pages had to be inventoried and cross-checked for duplicate content. Each page had to be checked, as the same content would often be repeated over and over again – even on the same page due to large scale cut-and-pasting. Once many of the duplicate content issues were handled both on the main site and the mini-sites, overall ranking also began to improve. Getting to the first page results typically in an exponential increase in website traffic, as it’s estimated that 50-70% of searchers never go past the first page of Google. 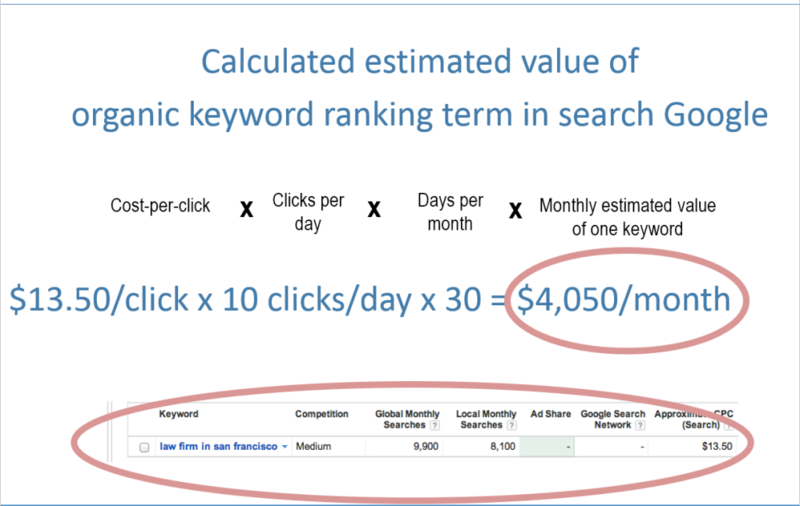 Prior to optimization, the firm ranked for more obscure long-tail keywords such as “la fitness class action lawsuit.” The following highly competitive terms combining the general term “law” and “law firm” with variations on “San Francisco” gained first place rankings for the first time. Melissa has worked with my firm on the Kerr & Wagstaffe group of websites (10 websites in total counting all their blogs). The firm has several heavily involved partners that we successfully work with through their marketing coordinator. She has been a tremendous help in strategically thinking through and explaining all of the options to the client. Here are a few: raising local search results, branding the firm more for the web, coming up under search engine terms relating to their practice areas, attorney names and big cases. She was instrumental in cleaning up some black hat SEO practices another SEO firm used, as well as getting them more search engine placements to push down a fraudulent blogger attacking one of the partners. Melissa has a solution for every problem, it is a delight to work with her ‘can do attitude.’ This is just one of four clients who all have multiple websites that Melissa consults with us. See more results> SEO Case Study: Expanded content and state-of-the-art website bring exponential growth in new traffic and clients to one of the world’s largest vintage Rolex watch dealers.